ASRX is a Stock Car Sim with ARCA, Truck, Grand National, and Cup vehicles. The article describes how to setup and participate in a race with fixed setups that permits changes on pit road. For some time, we have sought the ability to start a race with a fixed setup, but then allow changes on pit road. This should be fun and slightly different from the existing 'Open' or 'Fixed' setup racing because it puts everyone on the same playing field while still allowing drivers to adjust to track conditions and their driving style. In ARCA, we can change tape, wedge, air pressure, track bar, and spring rubbers on pit road. Here are the basics: The server is set to allow 'Open' setups. The race admin uploads a reference setup for a race. All drivers in the race use the 'Setup Sender' plugin to have their setups uploaded and verified using the 'Setup Viewer'. Each driver's setup is compared to the reference setup for compliance. Drivers and admins can use the 'Setup Viewer' to see that everyone is using the same setup. Note the race ID shown in bold. Your drivers will need this number. Run the Setup Viewer with the 'Flush setups' option checked. Only one person (the admin) should have this option checked. All drivers have to re-send their setups every time the setups are flushed. With the option selected, setups are flushed whenever the session changes. Drivers should not get in their car until the admin sees that the Setup Viewer has refreshed. Otherwise, their setup may get flushed and they will have an unknown setup status. Your race admin will provide a race ID. When you join the the race server, remove any notes in the currently loaded setup and type in the race ID. You do not need to save the setup. Get in the car (click 'Race'). When in the practice session, you should hear this sound. Get out of the car and go to the root setup folder (scroll all the way to the top and click on '..'). You will see a setup with the name of the track you are running. This is the fixed setup provided for this race. Load the setup. It should also contain the race ID in the note. After loading the setup, get back in the car and you should hear this sound indicating that your setup matches. Every time you get in the car, your setup will be compared to the reference setup. If your setup does not match during the qualifying or race session, you will hear this sound. At that point, you need to get out of the car and load the correct setup. With manual mode enabled, you will need to use CTRL+SHIFT+Z while in the car to upload the setup. Once you turn on the plugin, it will keep sending setups until you close the game. You do not need to turn it on again. Sending the setups for the rest of the session is required in order to prevent cheating. The home page at arcasimracingx.com shows a live race viewer for each race a few hours before the race is scheduled to begin. At the bottom of the race viewer is a link for 'Setups' that will display the Setup Viewer. 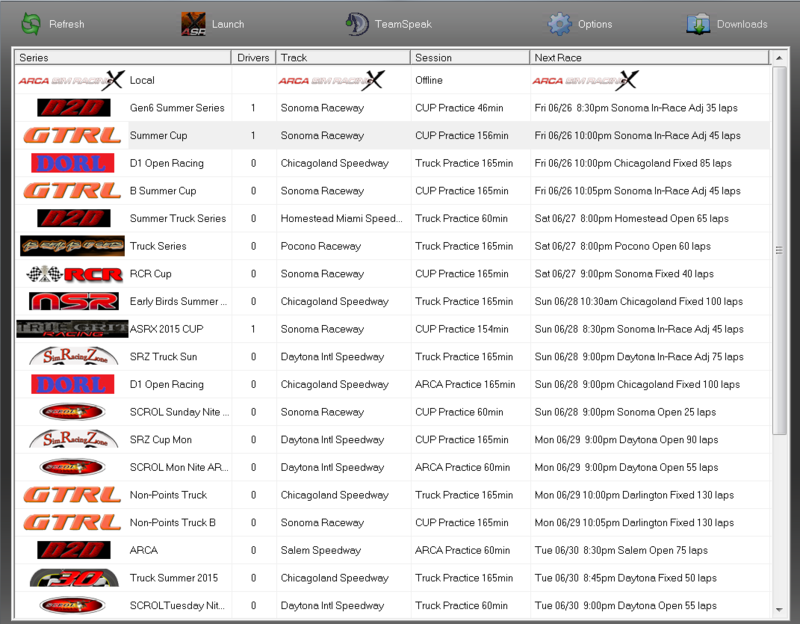 Admins can also get a direct link to the setup viewer for a race from the schedule editor. Setup compliance is unknown. Either no setup has been received from the driver or no reference setup exists. Setup is not compliant. In qualifying or race sessions, the non-compliant changes to the setup will be displayed.